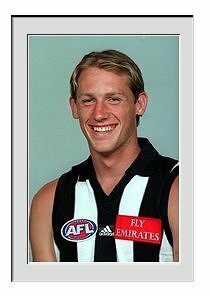 The number one draft pick in 1999, Fraser was hailed as the great white hope for the Magpies future. At the beginning of 2000, Coach Mick Malthouse stated that Fraser was unlikely to get much game time for the year. But come round 22, Fraser had played 21 matches and been a solid contributor in almost every one of them. Fraser’s AFL career started in the 3rd round of the Ansett Cup 2000. 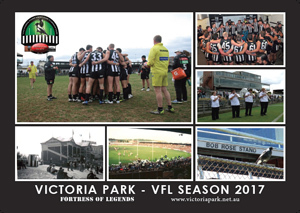 At Waverley Park against Fremantle, Fraser gave Magpies fans just a preview of what was to come. Fraser’s real AFL debut came in round 1 against Hawthorn. As the Pies thumped the Hawks, Fraser showed his talent playing up forward and in the ruck. Also making their debut that day were Ben Johnson and Leon Davis. 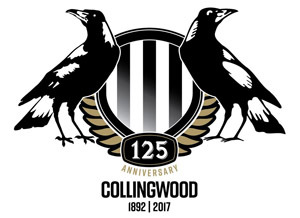 All three players have had a major role in the Magpie renaissance. Moreover, 2001 was a year where Fraser made his mark on the competition. Fraser took big marks, kicked big goals and showed real leadership beyond his years. His best game came against West Coast at Colonial Stadium in round 12. Fraser scored four goals in a best on ground display. But his season was not without controversy. In the ANZAC Day blockbuster against Essendon in round five, Fraser made two very costly mistakes in the first quarter. The first mistake was when Mark McVeigh dribbled the ball into the goal square, where Fraser was all on his own. Instead of picking the ball up, Fraser let it bounce into his hands. However, the ball continued to roll on its merry was through the goals without Fraser touching it. The second mishap came when in the back pocket; Fraser chipped the ball to Glenn Freeborn across goal. The ball sailed over Freeborn’s head and into the hands of Essendon’s Justin Blumfield. These mistakes would prove costly, as the Pies went down by nine points. On the eve of the 2002 season, Fraser was diagnosed with Osteitis Pubis and was tipped to spend a long time on the sidelines. But Fraser carried the injury for most of the season but performed below par. In the Qualifying Final against Port Adelaide, Fraser only had one possession and was very close to being dropped for the Preliminary Final. 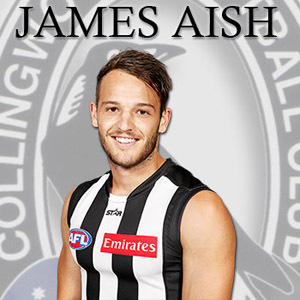 But Malthouse kept him in the side, and the move paid off when Fraser played a part in the Preliminary Final with two goals, while in the Grand Final, Fraser scored three goals in one of his best matches for the club. The year 2003 was a landmark year for Fraser, who finished fifth in the best and fairest. After a slow start to the season, Fraser won back the number one ruck position after Steve McKee, who had done so well the previous year, lost his spot as the ruck rules were changed. Fraser was one of the key players in the charge to the Grand Final, with his ruck work outstanding. On a disappointing Grand Final day, Fraser was the only shining light. Up against the huge Clark Keating and Jamie Charmann, Fraser not only held his own but broke even with the huge Lions. This year, 2004, has been interrupted by injury for Fraser, who after a bright start, injured his hamstring on ANZAC Day and missed the next three weeks. Upon return, Fraser starred against Melbourne, up against the AFL’s premier ruckman Jeff White, Fraser beat him, but it wasn’t enough to beat the Demons, who won by nine points. The next week against Sydney, Fraser held up the forward line with his strong marking and willingness for a competition. But once again, the Pies went down in a close one losing by six points.